On this day one year ago, St Johnstone had 24 points from their first 18 Scottish Premiership games. This season, they have four points more from one fewer game. So what has changed? Granted, they currently sit a couple of places lower in the division this term in eighth, but they were unbeaten in eight matches before last weekend and are playing far more attractive football. Before Sunday’s visit of Rangers, full-back Richard Foster tells BBC Scotland the about how younger players, a more open style, and new leaders stepping up have transformed the Perth side. Six first team players left McDiarmid Park in the summer. 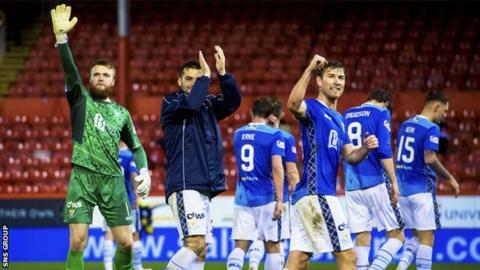 Striker Steven MacLean, midfielder Chris Millar and goalkeeper Alan Mannus – all in their mid thirties – were replaced with the likes of Tony Watt, Matty Kennedy, Drey Wright and Ross Callachan, all of whom are 25 or under. The squad’s average age has dropped from 28 – the oldest in the league – to 26 this season. Getting in to Europe the season before and having very little break took its toll. We don’t have a massive squad and it was a little bit older and we suffered from not having the break. The young players bring a freshness and an eagerness to impress. I’m not saying older players don’t have that but these guys are early on in their careers and are looking to make a name for themselves and do as well as they can. The recruitment of younger players came with the need to alter the side’s tactics, traditionally viewed as more direct and based on a solid defensive unit. St Johnstone have decreased the number of long passes per game, and place an emphasis on moving the ball wide and getting crosses into the box. They rank fourth in the Premiership for crosses per game. I think from pre-season the manager put more onus on us to pass out from the back. The style before was to get the ball forward as quickly as possible, whereas now he wants us to get on the ball, especially the centre-halves and the central midfielders, and pass between the lines. Initially the switch did not yield results as the club won just two of their opening eight league games, and were hammered 5-1 by Rangers and 6-0 by Celtic. But then came an international break and the chance to work on the training ground. What followed was the run of six wins and two draws in eight games, and just two goals conceded in that time – both against Hearts – before the most recent loss to Motherwell. In those two games, Rangers at Ibrox and Celtic at home, we were a bit too open and took the manager too literally in what he wanted us to do,” said Foster. “We were too open in terms of promoting both full-backs forward too soon, midfielders breaking forward too soon and wide players not tucking in enough. We realised we can still pass the ball more and keep possession but also be secure at the back and keep it nice and tight in midfield. Goalkeeper Zander Clark was the club’s second choice last season, making 16 league appearances to Alan Mannus’ 22. Clark kept three clean sheets in those games, and in 17 games this term already has eight shutouts – the third best in the Premiership. He has also made the second-most saves of any goalkeeper, with 61 from 83 shots faced. Zander has probably been our best player. I think he’s had this knack, especially in those eight games, of making big saves when we needed him to. I think that comes from more experience but it’s the sign of a good goalkeeper. There are times when you could be losing games 3-0 and your goalie makes a save but it doesn’t affect the outcome of the game. Midfielder Blair Alston signed from Falkirk in the summer of 2016. In his first two seasons at McDiarmid he made a total of 59 appearances, scoring four goals and providing seven assists. This season he has four goals in 10 appearances so far, but no assists. He drives from midfield, he can go past players, he’s got a good eye for a pass and when he gets within 25 yards of the goal his finishing is great. He’s got this ability to hit a shot with so much movement on it and it’s very difficult for the goalie to save it. If he’s playing a bit wider then he gets into little pockets of space. I think he’s a very intelligent football player and he scores big goals.